Total: 1 hr. 25 min. Make this stellar pie for your weekly pizza night! Dissolve the package of yeast in the warm water. Add honey and salt and mix to dissolve. Add this mixture to your stand mixer. Add olive oil. With the paddle attachment, turn the machine on low and start adding the flour until just combined. Switch to the kneading attachment and turn on medium speed. Add a little flour at a time until the dough is well combined and the dough has pulled away from the edges of the bowl. Continue to knead the dough at medium speed for 10–15 minutes. The dough should be springy. To test if the dough is done, tear off a small piece and slowly pull the dough at its four corners. If you can stretch the dough without it tearing and light can pass through it, then it's done. If it tears easily, keep mixing the dough for 2–3 minutes, and test it again. When the dough is done, spray a large bowl with olive oil and turn the dough into the bowl. Cover the dough with plastic wrap and let rise. If you want to use the dough soon, place it in a warm area for about 30 minutes or until the dough has doubled in size. If you can wait until tomorrow, place it in the refrigerator and let rise. Let the dough come to room temperature before working with it. Slowly and gently stretch the dough, turning it after each stretch. Continue to stretch until the dough is the size of the pizza stone. Lightly drizzle or spray the top of the dough with olive oil. Place the pizza dough on a stone in preheated oven. Bake for 10 to 15 minutes or until lightly golden brown. SaucePreheat a small skillet or sauce pan. Drizzle with olive oil. Add onions and kosher salt; sauté until tender. Add garlic, tomato paste, herbs, and red pepper flakes. Sauté until fragrant, about 2–3 minutes. Add water and wine. The alcohol will cook off and you need the alcohol to fully develop the flavor of the tomato. Add a bit more kosher salt and simmer for at least 15 minutes, or until the desired consistency. PizzaAfter precooking your pizza dough, remove from the oven and top with the pizza sauce. Sprinkle 2/3 of the cheese on top of the sauce. 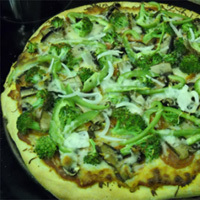 Then place the pepperoni, onions, green bell peppers, mushrooms, and broccoli on the pizza. Sprinkle the remaining 1/3 of the cheese on top of the pizza. Bake in the 450°F oven for approximately 10–15 more minutes, or until golden brown.